10 aquafil Water Refill Stations made their debut in the the 2014 LA Marahon held on Sunday March 9. The ASICS LA Marathon draws thousands of competitors from across the USA all running to help raise funds for the LA Marathon Official Charity program. The 46.16km (26.2 m) Stadium to Sea course was used this year and runs from Dodger Stadium to the Pacific Ocean passing through a number of LA’s famous landmarks such as the Walt Disney Concert Hall, Grauman’s Chinese Theatre, Rodeo Drive and Santa Monica Pier. The average race time was 5:26:19 and 12,385 men and 9,119 women completed the race. The men’s winner was Gebo Burka with a time of 2:10:37 and Amane Gobena was the womens winner with a time of 2:27:37. 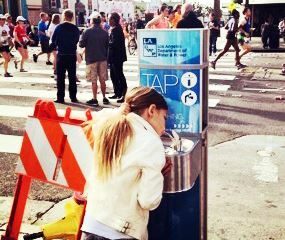 10 portable aquafil Pulse Water Refill Stations with Drinking Fountains were attached to water hydrants along the race route to supply spectators with drinking water whilst watching the race. These units also displayed the Drink Tap message making them a valuable tool in promoting the use of refillable water bottles and reducing the number of one use plastic water bottles being sold.